A full discussion of the process can be found here. 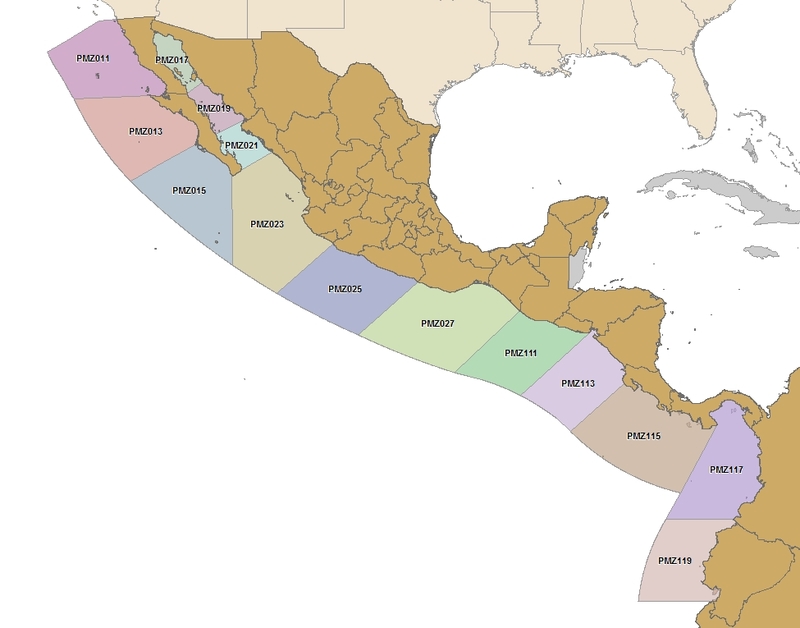 I am delighted to share with you the great news that the new NOAA forecast for the coastal East Pacific is now available on an experimental basis. Below you will find two URLs which will refresh (I believe) 4 times daily (230am PDT, 830am PDT, 230pm PDT, and 830pm PDT). Make sure the URL is in the top line of the message body without any spaces or indents. Check your mail in a few minutes and your email service should send you the contents of those two URLs. I will be incorporating this into a revised Preamble and will have it ready for you to download from the website. These should refresh automatically anytime the product is updated. It’s very interesting the way NOAA is approaching the launch of its new East Pacific forecast service. And the map at the left proves it. The revised map shows three zones for the Sea of Cortez – a result I believe of feedback from cruisers to the original proposed zones which had the Sea broken into two zones. As one cruiser put it (and I am paraphrasing), “The flaw in existing forecasts which have a “Northern Sea” above 27 degrees North latitude and another “Southern Sea” below 27 is that cruisers experience a very different reality,” he said. Many cruisers suggested that three zones would be more useful and NOAA responded. Now the Sea is divided into three sections – the Northern Gulf of California, Central, and Southern. As well, all the zones have had a “WFO” identifier associated with each zone which will make it easier for Saildocs to begin to distribute the forecasts. Have a look at the zones and let me know what you think. 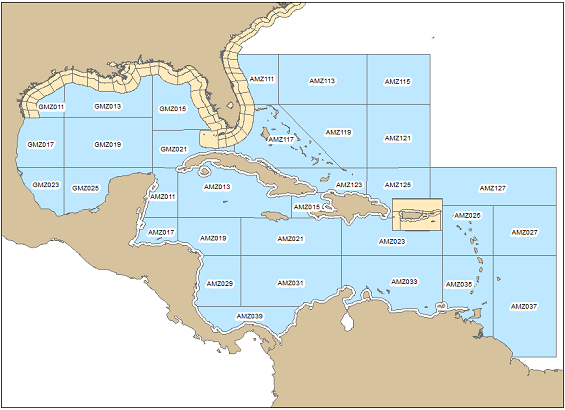 Also fyi – here is what the zones look like on the Atlantic coast in tropical waters. You’ll appreciate how extensive they are.